From “Whither Blogestan” by CGCS/Annenberg School. Used with permission. Understanding Iran isn’t easy. The definitions and words chosen can quickly demarcate whether writers are aware of the nuances at play within the complex socio-political ecosystem of contemporary Iran. What is a Persian blog? Are the key players inside Iran, or in the diaspora? In this study, as with many before it, Persian blogs are defined as Persian language platforms run by ordinary Iranians, both inside and outside of the country. These platforms have increasingly become Iran’s public sphere, acknowledging that many Iranians have left Iran, and the constraints that often stop Iranians from publicly expressing themselves inside Iran. Books like Blogistan, a study of the Internet’s role in contemporary Iranian politics, have tried to tackle this topic, with writers A.Sreberny and A. Khiabany quickly unravelling the misconception that reformist, or democratic-leaning writers dominate Persian language blogs. This notion naturally arose as writers transitioned from print to online reporting inside Iran during the reformist period of the Mohammad Khatami Presidency, which saw heavy crackdowns on print media. And by the early 2000s, the quantity of Internet users in Iran had reached the millions. While reformists inside Iran were initially the early adopters of the Internet as a political platform, all of Iran’s political factions and perspectives have since formed an online presence within the Persian-speaking blogosphere. Among Iran’s conservative population, which today is less united than during the Khatami era (see the existing divide between Iran’s hardliners and traditional conservatives here), several conservative online publications have been launched including Javan, Daricheh and Baztab, all of which are supported bygovernmental organizations including Sepah, the police, and the judiciary. John Kelly, also an author of the original Berkman study, prefaces the report by pointing to areas of continuity and change since 2008, highlighting an intensification in the soft war being waged over cyberspace between distinct Iranian political and religious factions. However, what this study highlights most closely are the profound changes that social networks have brought to the blogosphere, opening up a discussion as to whether this new medium is replacing or merely supplementing the Persian blogosphere. The research tracks 24,205 active Persian blogs through a web crawling analysis from 2008-2012, as well as a survey of 165 blog readers, complemented by a series of interviews with 20 bloggers from inside and outside of Iran. The key findings signal that people are still reading blogs, largely in the same numbers, but that the vast majority have qualitatively changed the way they interact with blogs. Either they frequent them less often, or they seek out sources that speak more to matters of news, foreign affairs, and economics, as opposed to previously when they sought out narratives of the everyday lives of bloggers, alongside social and cultural matters. The web crawling analysis illustrated that 40.89% of the blogs under review that were filtered belonged to reformist writers, while only 1.58% of conservative blogs were known to be filtered. Of blogs either deleted, or not found, 12.2% of them were affiliated with reformists, while only 3.9% of conservative blogs were deleted or not found. These numbers are a reminder that the struggle against government censorship and filtering practices has indeed taken a toll on the blogosphere. The report further supports this finding with qualitative data gathered from the bloggers themselves. While 35.2% reported that they started blogging in order to say things they couldn’t in public, 32.7% referred to a fear of censorship and 21.1% cited filtering as reasons why they had stopped blogging. 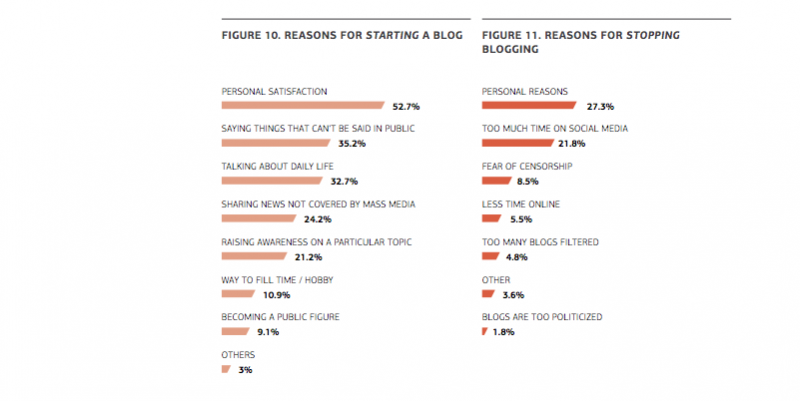 Interestingly, the things that motivate many bloggers to start blogging — “personal satisfaction” — seem increasingly tied to the reasons they cite when explaining why they stopped blogging. While 52.7% of the bloggers indicated they undertook blogging as personal satisfaction, 27.3% have indicated they have stopped blogging for personal reasons. The hopes many had invested in the Persian blogosphere as a space for democratization seems to be experiencing a struggle for its survival. This might signal diminishing possibilities for the free flow of information. But 35.2% of bloggers who responded also stated they abandoned blogging because of the time they were spending on social media, as opposed relinquishing the sharing of information and views online altogether — this is a trend that has been observed worldwide since the rise of major platforms like Facebook and Twitter. Despite blocks on both sites, experts estimate that roughly four million Iranians inside the country use Facebook. In considering how Iranian voices are heard online, the writers ask whether social networks are supplementing or supplanting the Persian blogosphere. They find that alongside socio-political shifts that have affected blogestan since its inception in the early 2000s, some writers have come to feel less comfortable publishing the details of their everyday lives on public forums than they were early on. Reasons range from perceived lack of audience interest to feelings of discomfort sharing their lives and political views openly. Bloggers also described social networks as a more user-friendly alternative, reflecting a shift relatively typical of global norms. Blogs still maintain clout, as they are often shared within these spaces, but increasingly discussions are being held within social networks, as opposed to the blogs. The writers suggests blogestan has evolved into a new phase, restructured by the current realities and tools that characterize the lives of Iranian Internet users in 2014. “Whither Blogestan” puts forth a strong, admirable effort to gather data and statistics about Iranian citizen media activity — but it lacks grounding in contemporary politics. While John Kelly suggests a likely impending advent of more relaxed laws regarding Internet use, the piece says very little about the new atmosphere of the Rouhani administration. This may be due to the fact that the study was initiated and completed mainly during the end of the previous administration. We can expect further follow-ups on this study to chart the direction of blogestan within the years that lie ahead, under the new administration. Already the nature of Facebook and Twitter as a platform of communication between members of Rouhani’s administration and Iranian and non-Iranian Internet users has begun to change the nature of Iranian public diplomacy, despite the prevailing filters on these websites. Needless to say, socio-political dynamics in Persian cyberspace is a vast topic that deserves further research, especially as it constitutes one of the biggest variables in shaping both the content and tools of Iranian politics, society, and culture. That mistake has been fixed. Thank you Mosaddegh for bringing that to my attention.